Want to be notified of new releases in donmccurdy/msdf-bmfont-web? Web tool for creation of MSDF bitmap font spritesheets and JSON, using msdf-bmfont-xml. The A-Frame text component, based on three-bmfont-text, use multi-channel signed distance (MSDF) fonts. MSDF helps to preserve sharp corners and edges in WebGL. Bitmap font rendering limits you to the characters included in the font (Unicode this is not), and in languages like Chinese, the number of possible characters is very large. So, as best practice, developers should load only the characters needed for a particular experience. 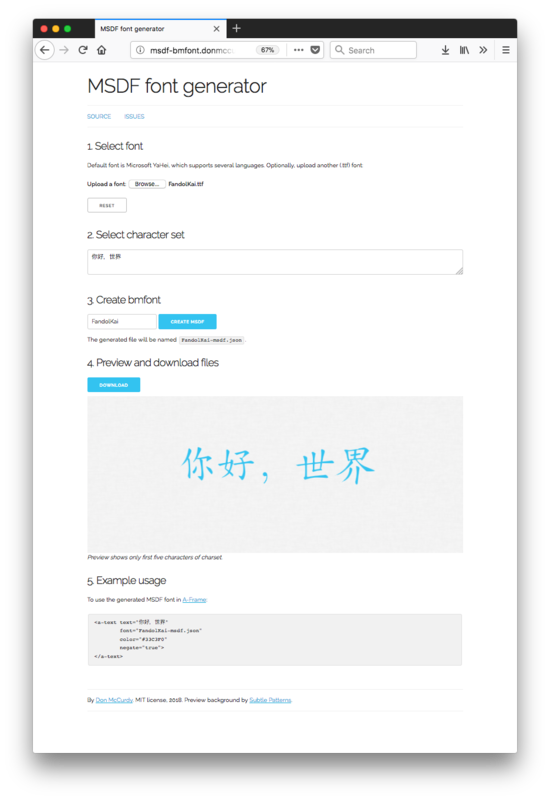 This web tool provides a simple interface for creating MSDF fonts. It does not (yet) expose any of the msdfgen options, but those may be added to the UI in the future. This tool uses a newer version of msdfgen, and to use them with A-Frame it is necessary to set text.negate=false. This flag is currently available on A-Frame master and will be released with A-Frame 0.8.0. MSDF fonts may be generated with Hiero. See this guide for generating SDF fonts.